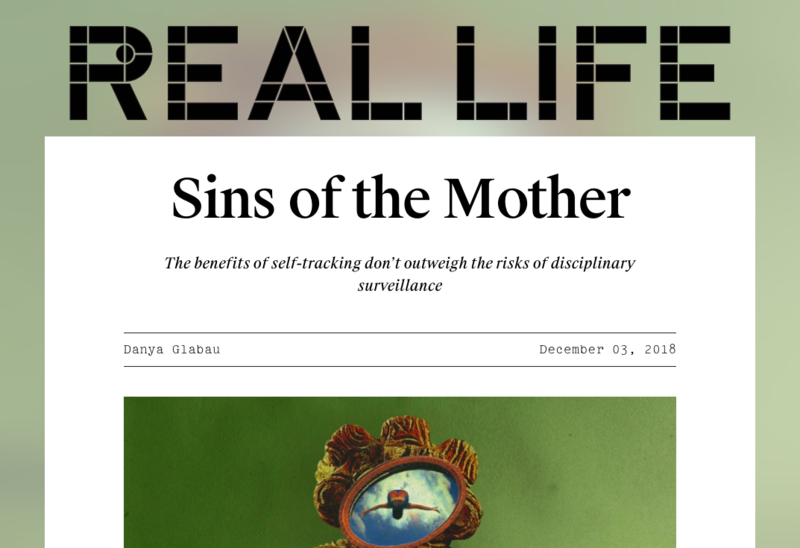 Sins of the Mother, an essay about the special risks posed by self-tracking technologies to parents and children, was published online by Real Life in December 2018. The temptation of transcendence through technology — the possibility to overcome weaknesses of body and willpower that seem to be part of the ordinary human experience — pervades digital life. Self-tracking speaks directly to this enculturated desire for transcendence. We hope to be able to change ourselves through knowing the numbers, so we seek out more and more information about ourselves to change our futures. But there are risks that come with seeking to exceed the embodied self through data. It requires relinquishing a great degree of control over our private activities and motivations. Complex desires and activities get broken down into fragments as they are captured and stored as data. The pieces of us can be tracked in minute detail by whoever is granted access under terms-of-service contracts. The clouds of data gathered about us by our technological add-ons quickly escape our control. Instead, they become the means by which we can be controlled.